Mixed Grill | I Am Not A Restaurant! Yes it was meat free Monday. No, I did not feel like going to the store. So we're going to consider this something like an Arnold Palmer, 1/2 lemonade and half iced tea. Except in this case it's a half vegan mixed grill (the other half is chicken). Skinless boneless chicken can take on flavor in 30 minutes on the counter. I like to pound it thinner, which reduces cooking time and raises the chances of juicy chicken. I'm still working over charcoal. My best advice is don't rush the coals. Drink some wine if you must, in fact drink regardless. The grilled veggies just have olive oil, but a big boost of flavor as well from a quick basil dressing. Marinate 1/2 hour countertop, or several hours in the fridge. If refrigerated, let come to room temp 15-20 minutes. Cook over coals or medium heat on the gas grill, flipped when edges turn opaque. Squeeze extra lemon. Large handful washed basil, no stems. Several pinches of salt and several grates of pepper. One garlic clove. Enough olive oil to make pourable dressing (about 1/3 of a cup). Blend in food processor. Add grated Italian cheese if you want. Great on grilled veggies, bread, fish or chicken. 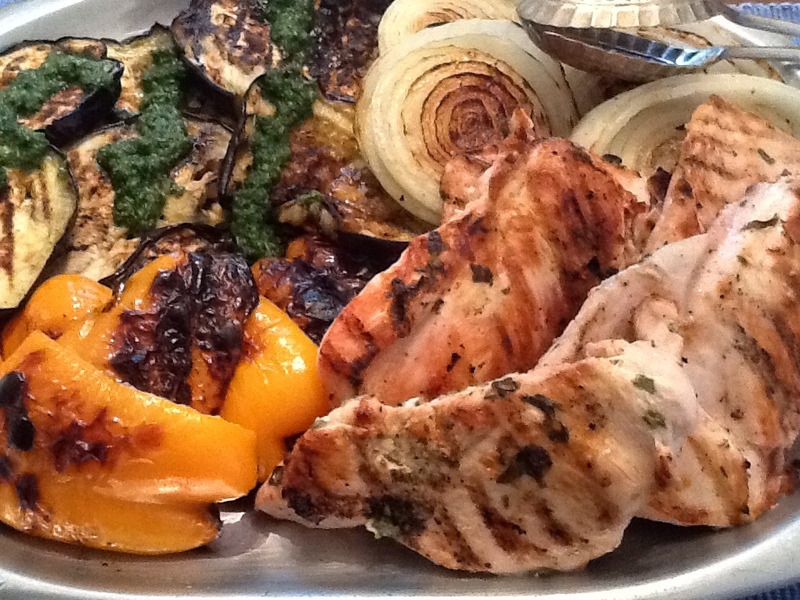 May20May 20, 2013 • By Betsy Karetnick • This entry was posted in Chicken, Dish of the Day, meatless, mostly meat-free, Recipes, summer treats and tagged basil dressing, chicken, half vegan, mixed grill, vegan, veggies. Bookmark the permalink. Sounds like a great, easy weeknight dinner! Now that my basil is planted I will definitely try this. I was just thinking today how much I miss you on the radio!! !